“School Begins,” Puck, January 25, 1899. ¶ 2 Leave a comment on paragraph 2 0 The word “Empire” might conjure images of ancient Rome, the Persian Empire, or the British Empire—powers that depended variously upon military conquest, colonization, occupation, or direct resource exploitation—but empires can take many forms and imperial processes can occur in many contexts. 100 years after the United States won its independence from the British Empire, had it become an empire of its own? ¶ 3 Leave a comment on paragraph 3 0 In the decades after the American Civil War, the United States exerted itself in the service of American interests around the world. In the Pacific, Latin America, and the Middle East, and most explicitly in the Spanish-American War and under the foreign policy of Theodore Roosevelt and William Howard Taft, the United States expanded upon a long history of exploration, trade, and cultural exchange to practice something that looked remarkably like empire. The question of American imperialism, then, seeks to understand not only direct American interventions in such places as Cuba, the Philippines, Hawaii, Guam, and Puerto Rico, but also the deeper history of American engagement with the wider world and the subsequent ways in which American economic, political, and cultural power has shaped the actions, choices, and possibilities of other groups and nations. ¶ 4 Leave a comment on paragraph 4 0 Meanwhile, as the United States asserted itself abroad, it received ever more numbers of foreign peoples at home. European and Asian immigrants poured into the United States. In a sense, imperialism and immigration raised similar questions about American identity: who was an “American,” and who wasn’t? What were the nation’s obligations to foreign powers and foreign peoples? And how accessible—and how fluid—should American identity be for newcomers? All such questions confronted late-nineteenth-century Americans with unprecedented urgency. ¶ 5 Leave a comment on paragraph 5 0 American interventions in Mexico, China, and the Middle East reflected the Unites States’ new eagerness to intervene in foreign governments to protect American economic interests abroad. ¶ 9 Leave a comment on paragraph 9 0 As many Americans looked for empire across the Pacific, others looked to Latin America. The United States, long a participant an increasingly complex network of economic, social, and cultural interactions in Latin America, entered the late-nineteenth century with a new aggressive and interventionist attitude toward its southern neighbors. ¶ 12 Leave a comment on paragraph 12 0 The United States’ actions during the Mexican Revolution reflected longstanding American policy that justified interventionist actions in Latin American politics because of their potential bearing on the United States: on citizens, on shared territorial borders, and perhaps most significantly, on economic investments. This particular example highlights the role of geography, or perhaps proximity, in the pursuit of imperial outcomes. But American interactions in more distant locations, in the Middle East, for instance, look quite different. ¶ 13 Leave a comment on paragraph 13 0 In 1867, Mark Twain traveled to the Middle East as part of a large tour group of Americans. In his satirical travelogue, The Innocents Abroad, he wrote, “the people [of the Middle East] stared at us everywhere, and we [Americans] stared at them. We generally made them feel rather small, too, before we got done with them, because we bore down on them with America’s greatness until we crushed them.” ((Mark Twain, The Innocents Abroad, or The New Pilgrims’ Progress (Hartford: American Publishing Company, 1869), 379.)) When Americans later intervened in the Middle East, they would do so convinced of their own superiority. ¶ 16 Leave a comment on paragraph 16 0 Uncle Sam, loaded with implements of modern civilization, uses the Philippines as a stepping-stone to get across the Pacific to China (represented by a small man with open arms), who excitedly awaits Sam’s arrival. With the expansionist policy gaining greater traction, the possibility for more imperialistic missions (including to conflict-ridden China) seemed strong. The cartoon might be arguing that such endeavors are worthwhile, bringing education, technological, and other civilizing tools to a desperate people. On the other hand, it could be read as sarcastically commenting on America’s new propensity to “step” on others. 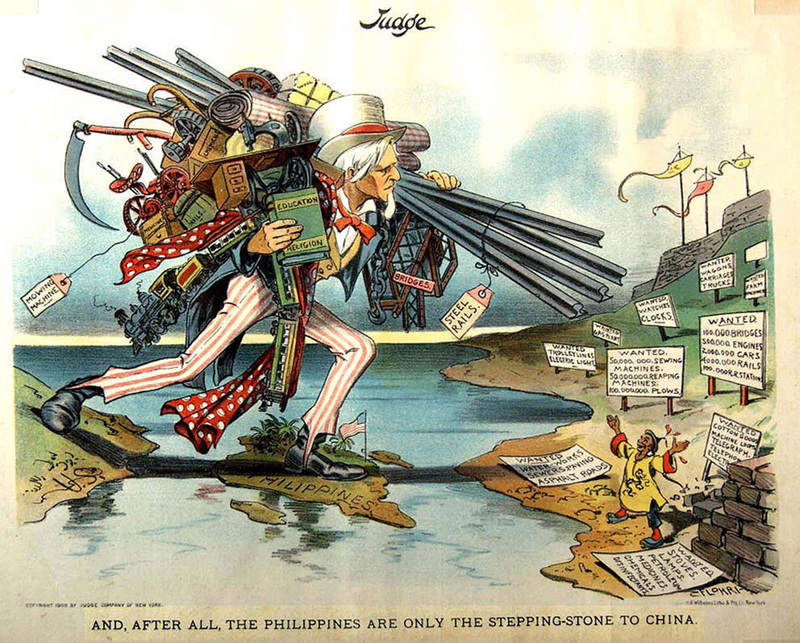 “AND, AFTER ALL, THE PHILIPPINES ARE ONLY THE STEPPING-STONE TO CHINA,” in Judge Magazine, 1900 or 1902. Wikimedia. ¶ 17 Leave a comment on paragraph 17 0 Although the United States had a long history of international economic, military, and cultural engagement that stretched back deep into the eighteenth century, the Spanish-American and Philippine-American Wars (1898-1902) marked a crucial turning point in American interventions abroad. In pursuing war with Spain, and then engaging in counterrevolutionary conflict in the Philippines, the United States expanded the scope and strength of its global reach. Over the next two decades, the U.S. would become increasingly involved in international politics, particularly in Latin America. These new conflicts and ensuing territorial problems forced Americans to confront the ideological elements of imperialism. Should the United States act as an empire? Or were foreign interventions and the taking of territory antithetical to its founding democratic ideals? What exactly would be the relationship between the US and its territories? And could colonial subjects be successfully and safely incorporated into the body politic as American citizens? The Spanish-American and Philippine-American Wars brought these questions, which had always lurked behind discussions of American expansion, out into the open. ¶ 18 Leave a comment on paragraph 18 0 In 1898, Americans began in earnest to turn their attention southward to problems plaguing their neighbor Cuba. Since the middle of the nineteenth century, Cubans had tried unsuccessfully again and again to gain independence from Spain. The latest uprising, and the one that would prove fatal to Spain’s colonial designs, began in 1895 and was still raging in the winter of 1898. By that time, in an attempt to crush the uprising, Spanish general Valeriano Weyler y Nicolau had been conducting a policy of reconcentration—forcing Cubans living in certain cities to relocate en masse to military camps—for about two years. Prominent newspaper publishers sensationalized Spanish atrocities. Cubans in the United States and their allies raised cries of Cuba Libre! And While the United States government proclaimed a wish to avoid armed conflict with Spain, President McKinley became increasingly concerned about the safety of American lives and property in Cuba. He ordered the battleship Maine to Havana harbor in January 1898. ¶ 19 Leave a comment on paragraph 19 0 The Maine sat undisturbed in the harbor for about two weeks. Then, on the evening of February 15, a titanic explosion tore open the ship and sent it to the bottom of the ocean. Three-quarters of the ship’s 354 occupants died. A naval board of inquiry immediately began an investigation to ascertain the cause of the explosion, but the loudest Americans had already decided that Spanish treachery was to blame. Capitalizing on the outrage, “yellow journals”—newspapers that promoted sensational stories, notoriously at the cost of accuracy—such as William Randolph Hearst’s New York Journal called for war with Spain. When urgent negotiations failed to produce a mutually agreeable settlement, Congress officially declared war on April 25. ¶ 20 Leave a comment on paragraph 20 0 Although America’s war effort began haphazardly, Spain’s decaying military crumbled. Military victories for the United States came quickly. In the Pacific, on May 1, Commodore George Dewey engaged the Spanish fleet outside of Manila, the capital of the Philippines (another Spanish colonial possession), destroyed it, and proceeded to blockade Manila harbor. Two months later, American troops took Cuba’s San Juan Heights in what would become the most well-known battle of the war, winning fame not for regular soldiers but for the irregular, particularly Theodore Roosevelt and his Rough Riders. Roosevelt had been the Assistant Secretary of the Navy but had resigned his position in order to see action in the war. His actions in Cuba made him a national celebrity. As disease began to eat away at American troops, the Spanish suffered the loss of Santiago de Cuba on July 17, effectively ending the war. The two nations agreed to a cease-fire on August 12 and formally signed the Treaty of Paris in December. The terms of the treaty stipulated, among other things, that the United States would acquire Spain’s former holdings of Guam, Puerto Rico, and the Philippines. ¶ 21 Leave a comment on paragraph 21 0 Secretary of State John Hay memorably referred to the conflict as a “splendid little war,” and at the time it certainly appeared that way. Fewer than four hundred Americans died in battle in a war that lasted about fifteen weeks. Contemporaries celebrated American victories as the providential act of God. The influential Brooklyn minister Lyman Abbott, for instance, declared that Americans were “an elect people of God” and saw divine providence in Dewey’s victory at Manila. Some, such as Senator Albert J. Beveridge of Indiana, took matters one step further, seeing in American victory an opportunity for imperialism. In his view, America had a “mission to perform” and a “duty to discharge” around the world. What Beveridge envisioned was nothing less than an American empire. 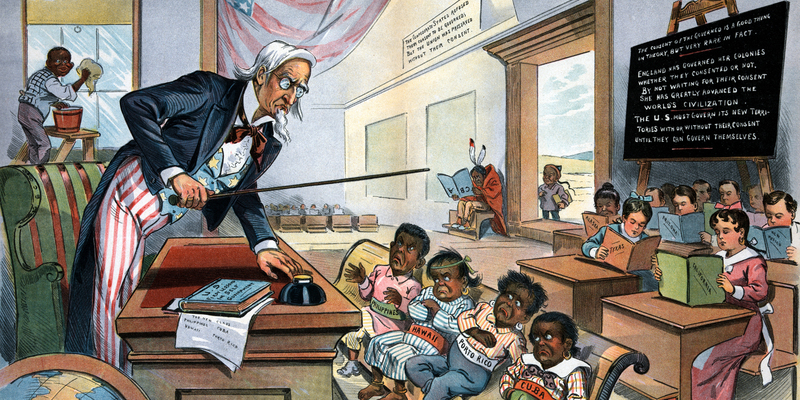 ¶ 22 Leave a comment on paragraph 22 0 A propagandistic image, this political cartoon shows a before and after: the Spanish colonies before intervention by America and those same former colonies after. 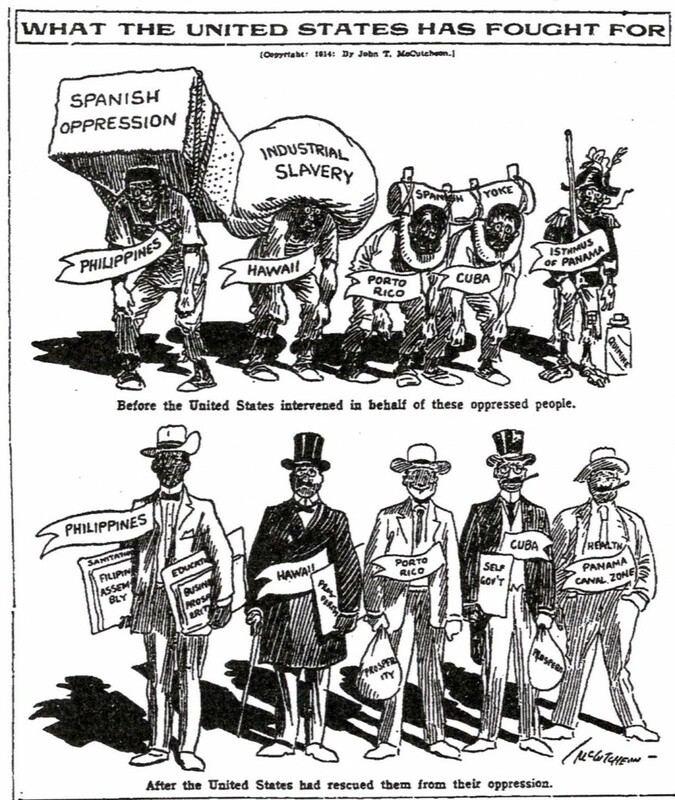 The differences are obvious and exaggerated, with the top figures described as “oppressed” by the weight of industrial slavery until America “rescued” them, thereby turning them into the respectable and successful businessmen seen on the bottom half. Those who claimed that American imperialism brought civilization and prosperity to destitute peoples used visuals like these, as well as photographic and textual evidence, to support their beliefs. “What the United States has Fought For,” in Chicago Tribune, 1914. Wikimedia,http://commons.wikimedia.org/wiki/File:Free_from_Spanish.jpg. ¶ 23 Leave a comment on paragraph 23 0 But the question of whether the United States should become an empire was sharply debated across the nation in the aftermath of the Spanish-American War and the acquisition of Hawaii in July 1898. At the behest of American businessmen who had overthrown the Hawaiian monarchy, the United States annexed the Hawaiian Islands and their rich plantations. Between Hawaii and a number of former Spanish possessions, many Americans coveted the economic and political advantages that increased territory would bring. Those opposed to expansion, however, worried that imperial ambitions did not accord with the nation’s founding ideals. American actions in the Phillippines brought all of these discussions to a head. ¶ 28 Leave a comment on paragraph 28 0 The Philippine Insurrection, or the Philippine-American War, was a brutal conflict of occupation and insurgency. Contemporaries compared the guerrilla-style warfare in challenging and unfamiliar terrain to the American experiences in the Indian Wars of the late-nineteenth-century. Many commented on its brutality and the uncertain mission of American troops. An April 1899 dispatch from a Harper’s Weekly correspondent began, “A week has passed—a week of fighting and marching, of jungles and rivers, of incident and adventure so varied and of so rapid transition that to sit down to write about it makes one feel as if he were trying to describe a dream where time, space, and all the logical sequences of ordinary life are upset in the unrelenting brutality of war.” ((John F. Bass, compiled in Marrion Wilcox, Harper’s History of the War in the Philippines (New York: Harper, 1900), 162.)) John Bass described his experiences in detail, and his reportage, combined with accounts that came directly from soldiers, helped to shape public knowledge about the war. Reports of cruelty on both sides and a few high profile military investigations ensured continued public attention to events across the Pacific. ¶ 30 Leave a comment on paragraph 30 0 Debates about American imperialism dominated headlines and tapped into core ideas about American identity and the proper role of the United States in the larger world. Should a former colony, established on the principles of freedom, liberty, and sovereignty, become a colonizer itself? What was imperialism, anyway? Many framed the Filipino conflict as a Protestant, civilizing mission. Others framed American imperialism in the Philippines as nothing new, as simply the extension of a never-ending westward American expansion. It was simply destiny. Some saw imperialism as a way to reenergize the nation by asserting national authority and power around the globe. Others baldly recognized the opportunities the Philippine Islands presented for access to Asian markets. But critics grew loud. The American Anti-Imperialist League, founded in 1899 and populated by such prominent Americans as Mark Twain, Andrew Carnegie, and Jane Addams, protested American imperial actions and articulated a platform that decried foreign subjugation and upheld the rights of all to self-governance. Still others embraced anti-imperialist stances because of concerns about immigration and American racial identity, afraid that American purity stood imperiled by contact with strange and foreign peoples. For whatever reason, however, the onset or acceleration of imperialism was a controversial and landmark moment in American history. America had become a preeminent force in the world. 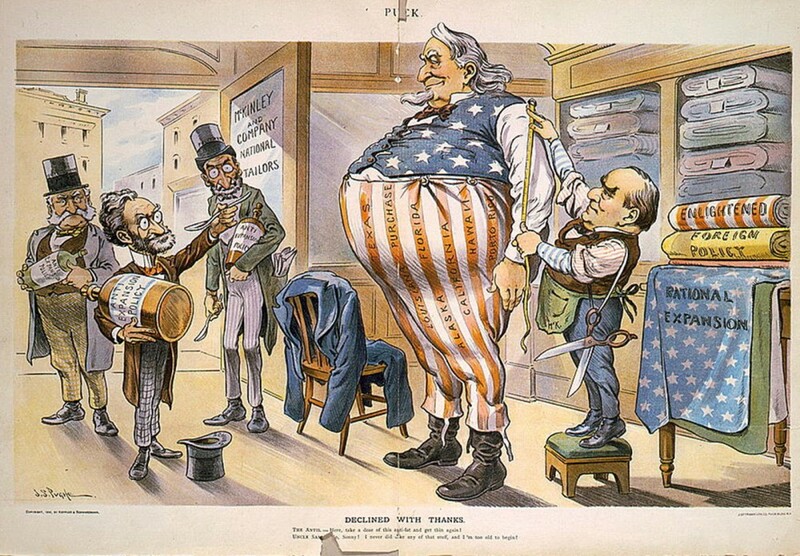 ¶ 31 Leave a comment on paragraph 31 0 Tailor President McKinley measures an obese Uncle Sam for larger clothing, while Anti-Expansionists like Joseph Pulitzer unsuccessfully offer Sam a weight-loss elixir. As the nation increased its imperialistic presence and mission, many like Pulitzer worried that America would grow too big for its own good. John S. Pughe, “Declined With Thanks,” in Puck (September 5, 1900). Wikimedia, http://commons.wikimedia.org/wiki/File:McKinleyNationalExpansionUncleSamPulitzer.jpg. ¶ 33 Leave a comment on paragraph 33 0 Under the leadership of President Theodore Roosevelt, the United States emerged from the nineteenth century with ambitious designs on global power through military might, territorial expansion, and economic influence. 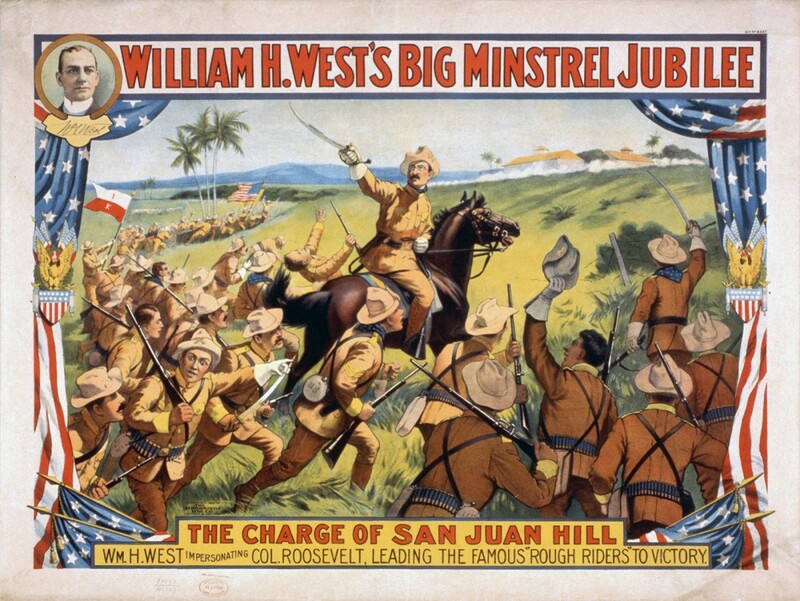 Though the Spanish-American War had begun under the administration of William McKinley, Roosevelt, the hero of San Juan Hill, Assistant Secretary of the Navy, Vice-President, and President, was arguably the most visible and influential proponent of American imperialism at the turn of the century. Roosevelt’s emphasis on developing the American navy, and on Latin America as a key strategic area of U.S. foreign policy, would have long-term consequences. ¶ 35 Leave a comment on paragraph 35 0 Teddy Roosevelt, a politician turned soldier, gained fame (and perhaps infamy) after he and his “Rough Riders” took San Juan Hill. Images like the poster praised Roosevelt and the battle as Americans celebrated this “splendid little war.” “William H. West’s Big Minstrel Jubilee,” 1899. Wikimedia, http://commons.wikimedia.org/wiki/File:West_minstrel_jubilee_rough_riders.jpg. ¶ 44 Leave a comment on paragraph 44 0 Though aggressive and bellicose, Roosevelt did not necessarily advocate expansion by military force. In fact, the president insisted that in dealings with the Latin American nations, he did not seek national glory or expansion of territory and believed that war or intervention should be a last resort when resolving conflicts with problematic governments. According to Roosevelt, such actions were necessary to maintain “order and civilization.” ((Theodore Roosevelt to William Bayard Hale, February 26, 1904, in Morrison, The Letters of Theodore Roosevelt, vol. 4, 740.)) Then again, Roosevelt certainly believed in using military power to protect national interests and spheres of influence when absolutely necessary. He also believed that the American sphere included not only Hawaii and the Caribbean, but also much of the Pacific. When Japanese victories over Russia threatened the regional balance of power he sponsored peace talks between Russian and Japanese leaders, earning him a Nobel Peace Prize in 1906. ¶ 55 Leave a comment on paragraph 55 0 For Americans at the turn of the century, imperialism and immigration were two sides of the same coin. 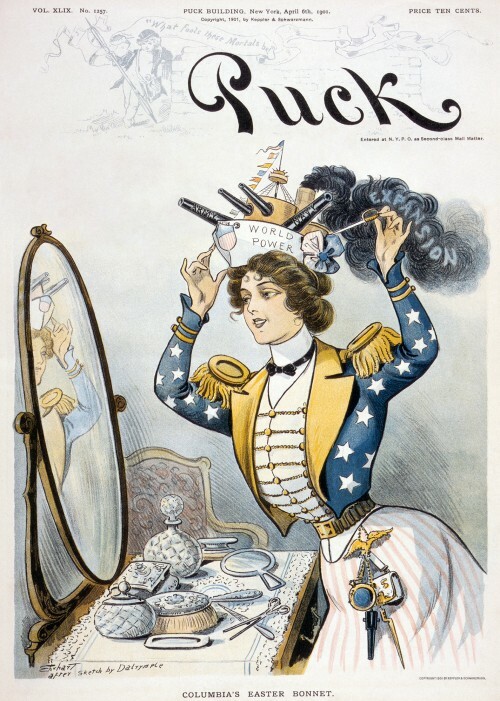 The involvement of American women with imperialist and anti-imperialist activity demonstrates how foreign policy concerns were brought home and became, in a sense, domesticated. It is also no coincidence that many of the women involved in both imperialist and anti-imperialist organizations were also very much concerned with the plight of new arrivals to the United States. Industrialization, imperialism, and immigration were all linked. Imperialism had at its core a desire for markets for American goods, and those goods were increasingly manufactured by immigrant labor. This sense of growing dependence on “others” as producers and consumers, along with doubts about their capability of assimilation into the mainstream of white, Protestant American society, caused a great deal of anxiety among native-born Americans. ¶ 68 Leave a comment on paragraph 68 0 The assault against immigrants’ Catholicism provides an excellent example of the challenges immigrant groups faced in the United States. By 1900, Catholicism in the United States had grown dramatically in size and diversity, from one percent of the population a century earlier to the largest religious denomination in America (though still outnumbered by Protestants as a whole). As a result, Catholics in America faced two intertwined challenges, one external, related to Protestant anti-Catholicism, and the other internal, having to do with the challenges of assimilation. ¶ 74 Leave a comment on paragraph 74 0 While American imperialism flared most brightly for a relatively brief time at the turn of the century, new imperial patterns repeated old practices and lived on into the twentieth century. But suddenly the United States had embraced its cultural, economic, and religious influence in the world, along with a newfound military power, to exercise varying degrees of control over nations and peoples. Whether as formal subjects or unwilling partners on the receiving end of Roosevelt’s “big stick,” those who experienced U.S. expansionist policies confronted new American ambitions. At home, debates over immigration and imperialism drew attention to the interplay of international and domestic policy, and the ways in which imperial actions, practices, and ideas affected and were affected by domestic questions. How Americans thought about the conflict in the Philippines, for example, was affected by how they approached about immigration in their own cities. And at the turn of the century, those thoughts were very much on the minds of Americans. ¶ 76 Leave a comment on paragraph 76 0 This chapter was edited by Ellen Adams and Amy Kohout, with content contributions by Ellen Adams, Alvita Akiboh, Simon Balto, Jacob Betz, Tizoc Chavez, Morgan Deane, Dan Du, Hidetaka Hirota, Amy Kohout, Jose Juan Perez Melendez, Erik Moore, and Gregory Moore. ¶ 77 Leave a comment on paragraph 77 0 Recommended citation: Ellen Adams et al., “American Empire,” Ellen Adams and Amy Kohout, eds., in The American Yawp, Joseph Locke and Ben Wright, eds., last modified August 1, 2016, http://www.AmericanYawp.com. Harris, Susan K. God’s Arbiters: Americans and the Philippines, 1898-1902. New York: Oxford University Press, 2011. Higham, John. 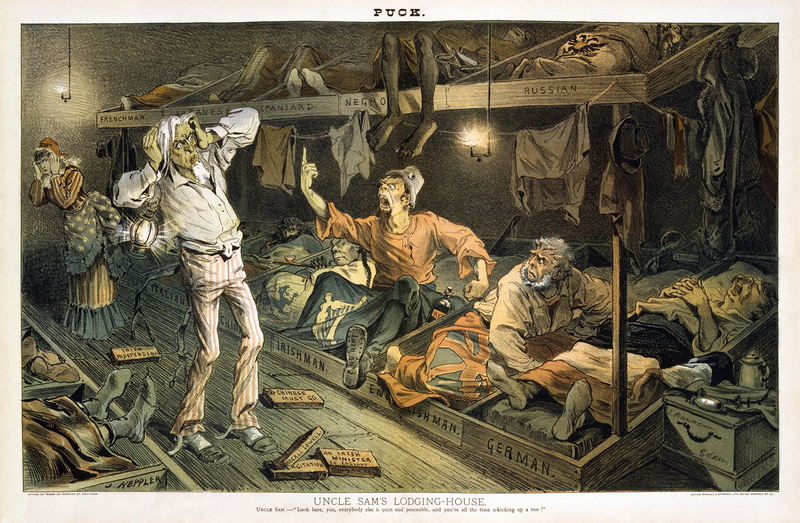 Strangers in the Land: Patterns of American Nativism, 1860-1925. New Brunswick: Rutgers University Press, 1988. Jacobson, Matthew Frye. Barbarian Virtues: The United States Encounters Foreign People at Home and Abroad, 1876-1917. New York: Hill and Wang, 2001. Kaplan, Amy. The Anarchy of Empire in the Making of U.S. Culture. Cambridge: Harvard University Press, 2002. Lears, T. J. Jackson. 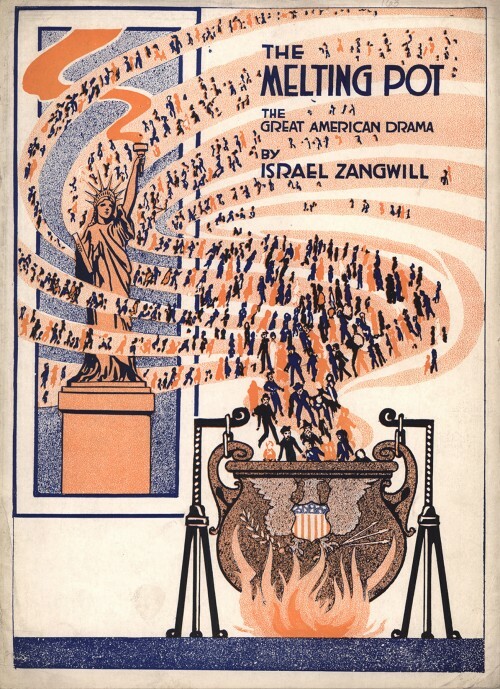 Rebirth of a Nation: The Making of Modern America, 1877-1920. New York: Harper Collins, 2009. Linn, Brian McAllister. The Philippine War, 1899-1902. Lawrence: University Press of Kansas, 2000. Love, Eric T. L., Race over Empire: Racism and U.S. Imperialism, 1865–1900. Chapel Hill: University of North Carolina Press, 2004. Rosenberg, Emily S. Spreading the American Dream: American Economic and Cultural Expansion, 1890-1945. New York: Hill & Wang, 1982. Silbey, David. A War of Frontier and Empire: The Philippine-American War, 1899-1902. New York: Hill and Wang, 2007. Williams, William Appleman, The Tragedy of American Diplomacy. New York: W.W. Norton, 2009 (1959).